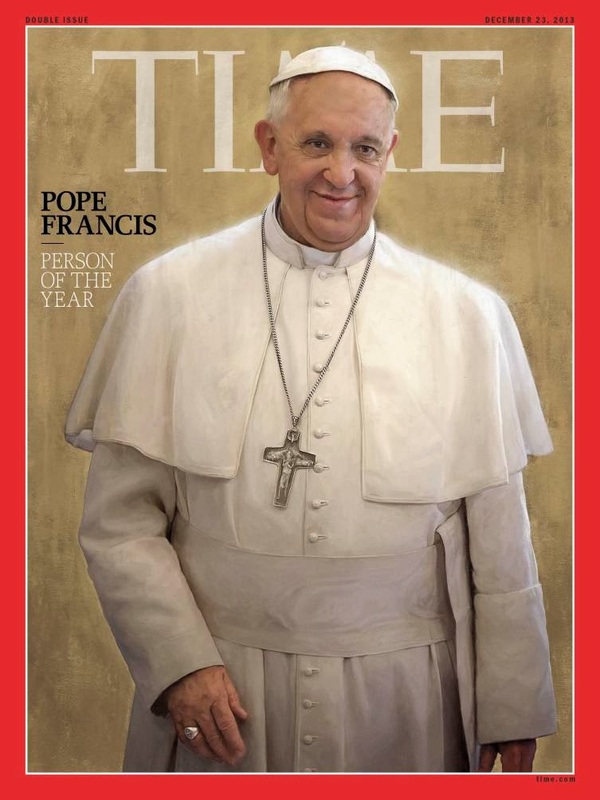 So, 2013's Person of the Year is none other than Pope Francis. I'm sure he's breathing a sigh of relief that he beat out the the patroness of twerking, Miley Cyrus, and a man who unleashed deadly chemical weapons on his own people, Bashar al-Assad. I reckon Ted Cruz and Kathleen Sebelius canceled one another out. Without question, at least to my mind, of the ten nominees, the Holy Father's great gift has been to welcome a fresh, rejuvenating Spirit into the Catholic Church. A friend asked me, several hours after yesterday's announcement, if I was "proud" of the Pope. I didn't know quite what to say. It would seem that I should be proud, or happy, but perhaps I was above all relieved because the Holy Father is "Person of the Year" because he points away from himself. I know some of the Pope's critics think he's putting on a show, that he's hamming it up for the cameras, but I think we're witnessing the read deal. This guy loves the Good News of the Gospel and he's giving all of us a glimpse of how it looks in one particular life. Very often, we hear about an event "grabbed headlines." Celebrities, corporations, users of Twitter, Facebook, and YouTube: the temptation is always to thrust oneself into the spotlight, to grab attention for oneself. The Pope is to be appreciated, not because of his office or some of his more attention-grabbing gestures, but because he affirms again and again that he is who he is because of his faith. In nine months, his public witness has done what countless homilies haven't managed: to call people to at least consider what it might be to open themselves up, to allow themselves to undergo God's Holy and creative Spirit, and to be born anew in faith. The Enduring Problem of Abusive Priests?